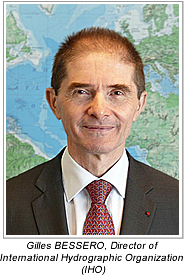 CARIS is delighted to announce the addition of Gilles Bessero, Director of International Hydrographic Organization (IHO), as a keynote speaker at CARIS 2014. Mr. Bessero will be the closing keynote speaker on Thursday, June 5. Mr. Bessero will join Bruno Frachon, Director General of SHOM, and Wendy Watson-Wright, Executive Secretary and Assistant Director General of the Intergovernmental Oceanographic Commission of UNESCO, as the keynote speakers for CARIS 2014. With the addition of these respected industry speakers CARIS 2014 will be an event you will not want to miss.